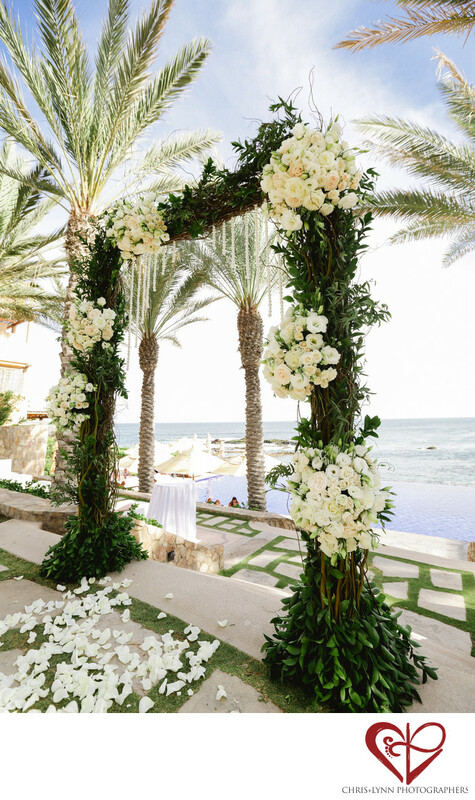 Florist Elena Damy’s beautiful ceremony arch looks stunning, and the view beyond it is truly breathtaking. The sky is a beautiful blue, and a few wispy clouds provide some shade. The arch is made of dark brown trunk with green leaves, and six white bouquets of flowers bloom from the arch. At the foot of the arch, the aisle is scattered with white rose petals. Beyond the arch, steps lead down to one of Esperanza Resort’s beautiful infinity pools. Beyond the pool, views of the blue ocean stretch in either direction. We are always amazed by the incredible views of the ocean at these Cabo San Lucas venues. The bride and groom picked the perfect place to declare their love for each other and exchange their vows. We can’t imagine a better place for a wedding ceremony. 1/250; f/5.6; ISO 200; 16.0 mm.